In beautiful Echo Park in western U.S. city of Los Angeles, two-headed tots and raven-haired toddlers ran giggling together along the grassy banks of the lake while saucer-sized lily pads bobbed as dragonboats raced by. A stone's throw away, under a perfect summer sky, visitors snapped selfies in front of a Chinese-style moon bridge which arched over a motionless inlet skirted with nodding reeds. This bucolic scene was not in the countryside, but right in the heart of Los Angeles, at the 38th annual Lotus Festival on Saturday. The festival is a popular Angeleno celebration sponsored by the Los Angeles Department of Recreation and Parks and will bring 200,000 festivalgoers together this weekend to celebrate the diverse pan-Asian and Pacific Island communities and culture of Los Angeles. 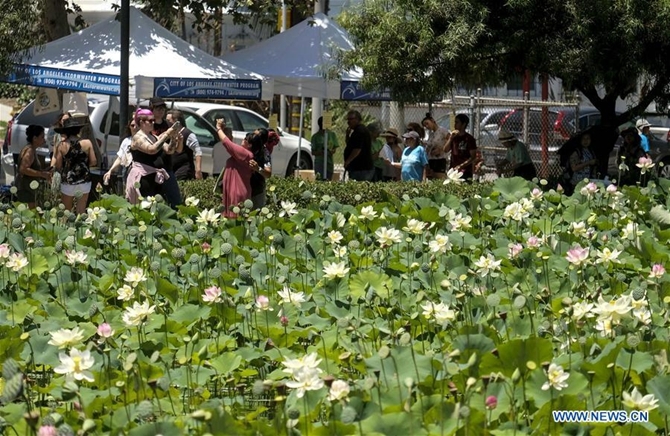 "The Lotus Festival started small, but with the help of its passionate supporters, it has bloomed just like the Lotus flower to celebrate the beauty of our city and its people," enthused David Ryu, member of the Los Angeles City Council. Each year the festival showcases a different country and culture, and this year it is honoring China and the vibrant Chinese culture which has been an integral part of Los Angeles and California. Elliot McDaniel, an American who took Asian studies in college and has spent time in China, told Xinhua, "I'm really happy this event is available. I feel like I have been exposed to a lot of China. This can expose other people that may not have the privilege that I've had to experience such a cool and unique culture." The Chinese pavilion also offered lessons on Chinese culture and arts, such as the ancient art of calligraphy and the delicate art of paper cuts. "I love the music and dances of China. They are so unique, like nothing you've ever seen before," one booth vendor gave her name as Virginia said. "These cultural events and people-to-people exchanges have a positive impact on bilateral relations and form the foundation of our strongest relationships. They can make people in both countries realize the importance of maintaining good, steady relations and world stability," Zhang told Xinhua.